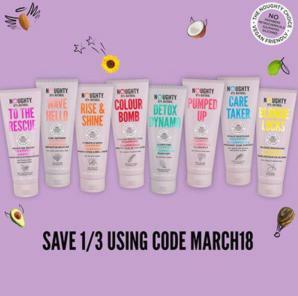 The Vegan Magpie: Noughty Haircare offer! Noughty haircare are vegan and they are proud to say they are 97% natural, not using any silicones, parabens, sulphates or petrochemicals. They do not test on animals (this should be obvious from being vegan but since L'loreal are sneakily using the vegan word I'm just confirming this!) and any palm oil used is obtained from RSPO members. Shipping is free on all orders over £10, or £2.95 if under £10. They have a whole heap of different products for varying hair types, so there should be something to suit most people!